Preserving dance for history and sharing it beyond the limits of a theatrical experience has been a stubborn challenge for dance lovers. When the dance publication Dance Ink first appeared on the scene in 1989, it broke ground by bringing the dance experience to the page by presenting photographic performances of world-class dancers by world-class photographers. Now 23 years later, and renamed 2wice Arts Foundation, Patsy Tarr, 2wice’s founder and editor in chief, and Abbott Miller, its art director, still driven by their restless imaginations, broke important ground once again with “Fifth Wall.” “Fifth Wall,” an app for the iPad, peels the dance off the page, lifting it onto a new digital stage that gives it a three-dimensionality not afforded even by photographs. 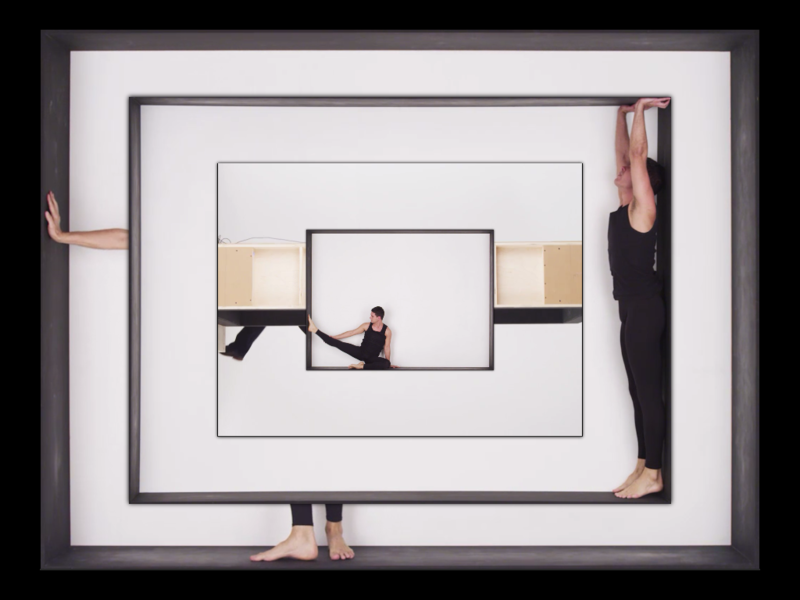 What is first seen is choreographer/dancer Jonah Bokaer performing inside a specially created box scaled to the dimensions of the iPad screen. Created by Bokaer for the iPad, the four dances can be reframed in multiple ways by its viewer, giving the illusion of multiple dances taking place simultaneously, or one dance with multiple points of view. By offering the user the ability to shift the sequence of events and add, eliminate, expand and layer images through their fingertips, “Fifth Wall” invites the viewer to participate in the making of a dance. The dances were shot with a special camera able to rotate 90 degrees vertically and horizontally, while the box, set on roller wheels, can swivel 360 degrees. That flexibility, along with Bokaer’s carefully crafted choreography, enables the app’s magical, gravity-defying hijinks. The music for “Fifth Wall,” an original score, was co-composed by Eric Beach, Josh Quillen, and Jason Treuting of So Percussion. The video director was Ben Louis Nicholas. “Fifth Wall” is available for the iPad for $0.99 and can be purchased by visiting the app store through this link: http://bit.ly/NxlICg. “Fifth Wall” is the second app created by 2wice. Its first, released in July 2011, is comprised of selected photographs of the Merce Cunningham Dance Company that had appeared in four special Cunningham-dedicated issues of 2wice over the past decade. The app was designed to be its own Cunningham Event. Its photographs morph, image into image, like a dance. The viewer is able to determine the speed of the changing images. Available free of charge on the web, the app also includes videos of Bokaer and Holley Farmer, both Cunningham alums, dancing short selections of Cunningham’s work. To download the Merce Cunningham Event app for the iPad go to http://bit.ly/KKEiut. For more information about 2wice Arts Foundation, please visit http://www.2wice.org. Patsy Tarr is the Founder and President of the 2wice Arts Foundation and serves as the Executive Editor of 2wice, Editions 2wice, 2wice Books and 2wice Media. She is on the boards of Chez Bushwick, The Central Park Conservancy, and is a former Board Member of the Cunningham Dance Foundation. She is the owner of a unique collection of Geoffrey Beene couture. Abbott Miller is a designer, art director, writer, and a partner in the international design studio Pentagram. He has served as Editor and Art Director of 2wice since its inception, collaborating with leading choreographers and photographers on this unique performing and visual arts publication. Prior to 2wice he served as designer of the award-winning quarterly Dance Ink. A retrospective of his design work for 2wice and Dance Ink was held at the American Institute of Graphic Arts in 2010. He studied at Cooper Union in New York and later founded the multidisciplinary studio Design/Writing/Research. Abbott has received numerous honors, including medals from the Society for Publication Designers and three nominations for National Magazine Awards. His work and critical writing has appeared in Eye, Print, I.D. and other publications, and he is the co-author of four books, including the classic Design/Writing/ Research: Writing on Graphic Design. A survey of his design work, Open Book: Design and Content, will be published by Princeton Architectural Press in 2012. Jonah Bokaer is an international choreographer and media artist whose collaborations with artists and architects integrate design and choreography. Bokaer began his own choreographic work in 2002, and has since been acknowledged with numerous honors and prizes, most recently the Prix Nouveau Talent Chorégraphie by the Société des Auteurs & Compositeurs Dramatiques (Paris), the Jerome Robbins Special Fellowship from the Bogliasco Foundation (Italy), and Crain’s NY Business “40 Under 40” (all awarded in 2011). In 2008-2009 Bokaer became the first dance artist to be appointed a Young Leader of the French American Foundation. He led a group of choreographers in the formation of Chez Bushwick (2002), and later co-founded CPR – Center for Performance Research (2008), a 4,000 square foot LEED green arts facility in Williamsburg.